sAy AnYtHiNg: Wanna Play a Game? Now, don't get yourself all in a froth, I am not actually giving anything away with this particular game, just having a little fun. Fear not, however, more giveaways to come I assure you. Anyway, back to today's game. Does anyone remember the carnival or amusement park game where someone tries to guess your age? Well today, you are the guesser and Robert Plant is the guessee. Apparently it has become the unofficial classic rock week with the Diva here at Sayanything, what with my post about Slash earlier this week and now this. Hey, when blog fodder presents itself, far be it from me to ignore it. 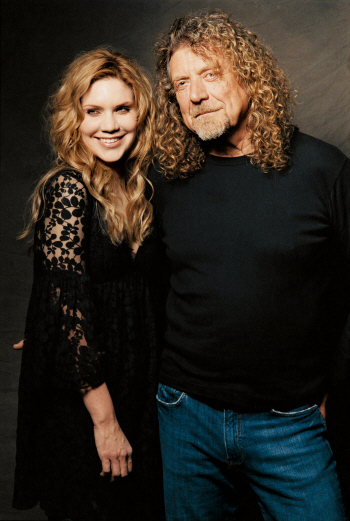 Robert Plant (former lead singer of Led Zeppelin, just in case you didn't know) has recently released a CD with Allison Krauss and I stumbled across this publicity photo of the two of them, and the carnival game was born. So, take a look at the picture and leave me a comment on how old you think Robert Plant is, and no fair looking up the answer anywhere, just guess! It probably doesn't help that he is standing next to the fresh faced Krauss, but give it your best shot. If you win, you will have the satisfaction of being a "winner" for the day, which probably beats the stuffed animal you would have won at an actual carnival. I'll post his real age tomorrow. I have no idea...but he's got to be old-ish! 72? And if he is in his sixties or seventies...he looks really good! I'm going with 68ish. Please let us now ho old the gal is too. Thanks. I figure he's got to be least 70, although he could be in his 60's. I'll agree with Lisa's comment that he looks pretty good. (Altho most men his age would have cut his hair by now, but what do I know?!) And he looks clean--a miracle! I think he's younger than he looks. 62? Um? Maybe 68? He doesn't look that old, but I'm guessing that is the point!! Guess I'm on the younger end of the spectrum - I'm gonna say 52. Although I remember reading an article about him a few months ago - and I was surprised by his age, though I don't remember which way I was surprised!!! Funny little blonde memory! I think he's probably younger than he looks. (Hard living will do that to you.) I would guess 48.